April Sunday 21st - Foal Lane animal sanctuary Biggin Hill. A great sanctuary looking after cows, ponies, pigs, goats, and cats. Many of them rescued from cruel conditions and many abandoned animals. A special thanks to Poonam Doshi who is a volunteer at the sanctuary. On behalf of Jain Animal Sanctuary we made a donation of £200.00. Cheque being presented by Kumarbhai Patira. 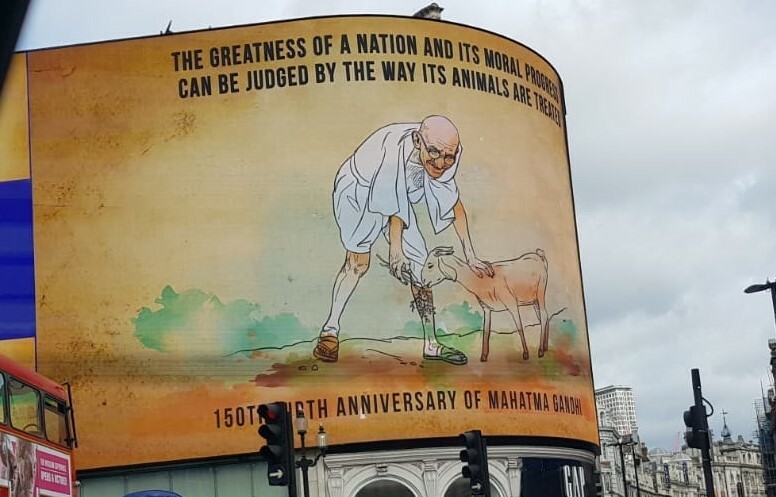 October 2nd 2018 - Mahatma Gandhi's birth anniversary was celebrated in London with this bill board in Piccadilly Circus, London. A sign of changing times as vegetarianism and veganism as well as compassion to animals are issues which have entered the national conscience. Year of the animal - The piece by Elisa Allen brings good cheer for the beginning of the New Year. Granting of fundamental rights to animals is something we as a human species have neglected for centuries. Our treatment of animals has been unparalleled in its sheer scale of brutality. It has hurt animals and it has also had a negative impact on the human species. We have morally lowered ourselves in failing to show basic compassion to animals who share this planet with us. Our violence towards animals rebounds on our species. It hangs like a foreboding, menacing cloud striping us of compassion and empathy with other living beings. We need to take that huge leap in abandoning violence towards animals and by doing so we will be doing ourselves a huge favour as well. We had our 37th annual a Vegan lunch on Sunday 17 December. This event was started to promote friendship with our Christian friends, to introduce them to the delights of Indian food and to convey the message that the Indian community is proud to be British. If all Indian organisations held similar event the impact would be amazing. The leader of Croydon Council Tony Newman said, 'This event signifies all that is positive about Croydon'. Around 120 people enjoyed a feast. The menu was: Starters: Samosa and Patra, Main course: Hot Rotis, Potato, Aubrigine Sabji, Salad, Dahl and Rice followed by Vegan Cake, Tea and Coffee. Members of 7th Day Aventist Church who also promote Vegetarianism sang Carols. For 37 years this event has continued! 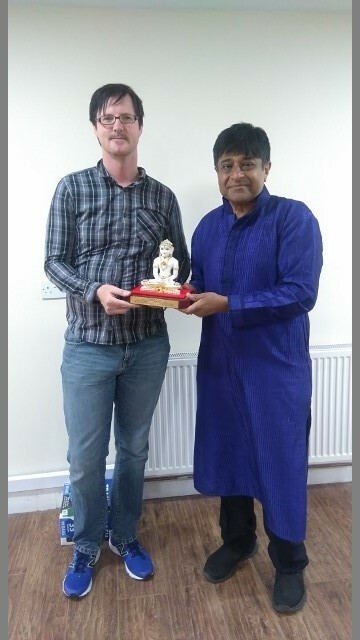 A Mahaveer award was presented to Dean Bracher representing Birmingham Animal Action. The event was held on Saturday 24 June 2017. The picture shows Nitin and Dean with the award. 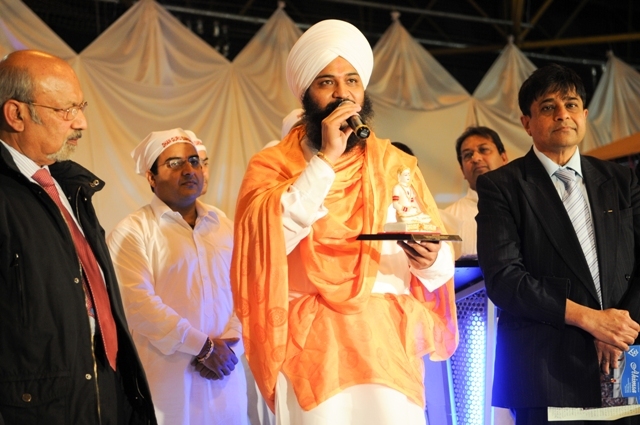 The award was formally given to Dean by Amrinder Jain, pressident of the Jain Ashram. London VegFest Kensington Olympia was held over the weekend of Oct 22-23. Around 15,000 people attended this annual event promoting a Vegan way of life. We had a stall. 4 people took a pledge to go vegetarian and 10 vegetarians pledged to go Vegan. Compassion to animals and not eating them has been a part of our heritage for tens of thousands of years. I met many British friends who simply love India for its heritage of Ahimsa. All the Jain organizations celebrated Lord Mahaveer's Birthday on Sunday 1st.May 2016 in Harrow. There were around 750 people present. 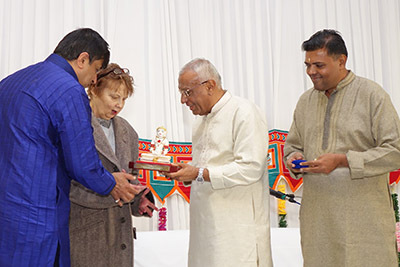 We presented Mahaveer Awards to two outstanding individuals. On behalf of League Against Cruel Sports they were monitoring illegal Fox hunt when they were brutally attacked. Darryl Cunnigham had a cracked vertebra in the neck and was hospitalized. Roger Swaine also sustained injuries. The awards were given away by Dr. Mukul Shah and Dr. Freya Shah as well as Anubhai and Taraben Shah. You were brutally attacked while monitoring a fox hunt in Leicestershire. Your courage and compassion for defenceless animals is exemplary. We call your kind act 'Abhay Daan'. It means giving someone protection from fear of death. Generations to come will be inspired by you. We salute you. In the first picture from left: Barbara Gardner from Interfaith Alliance for Animals, Dr. Mukul Shah, Dr. Freya Shah, Roger Swaine, Darryl Cunnuingham. Second picture: From left Roger, Darryl, Anubhai and Taraben. Letter Published in the Independent, 29 Dec 2015. Dear Sir The article by Tom Bawden (24 Dec), regarding the potential of mass migration and human suffering due to global warming makes sobering reading. What is often overlooked is that the biggest causes of global warming is the methane gas produced by billions of farm animals raised for meat. Almost 40% of world's fresh water resources is used up in raising these animals. Animals are voracious consumers of water. Over grazing is turning huge swathes of the Earth into deserts. Almost 40% of worlds cereals are fed to these animals rather then feeding the poor. The billions of tones of waste produced by these animals seep into our waterways causing massive pollution and acid rain which destroy trees. Unless human beings turn away from a meat based diet to a plant based diet, a catastrophe awaits us.The solution to solving the global warming crisis is not with international treaties but with each one of us. Let us be the change we want. Letter Published in today's Independent, 16 July 2015. The Independent took a principled and admirable stand in opposing any change as regards to fox hunting. I have always wondered why some people go hunting with the help of guns or hounds. If they were to take on an animal on their own I would have some respect for them. "Presented to Founders of F.R.I.E.N.D. Animal Rescue Sanctuary.You have dedicated your lives to the care of animals for 18 years.We salute your compassion which is as deep as the Ocean." 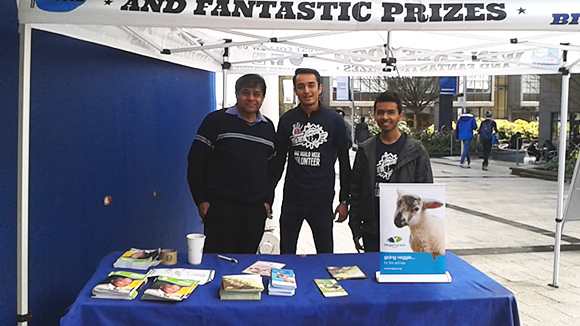 On the 26th of March the Young Indian Vegetarians visited Brunel University where we held a vegetarian event. Six persons took a pledge to go vegetarian. In photo (from left) Nitin Mehta with students Akshar Patel and Nirav Nagda. 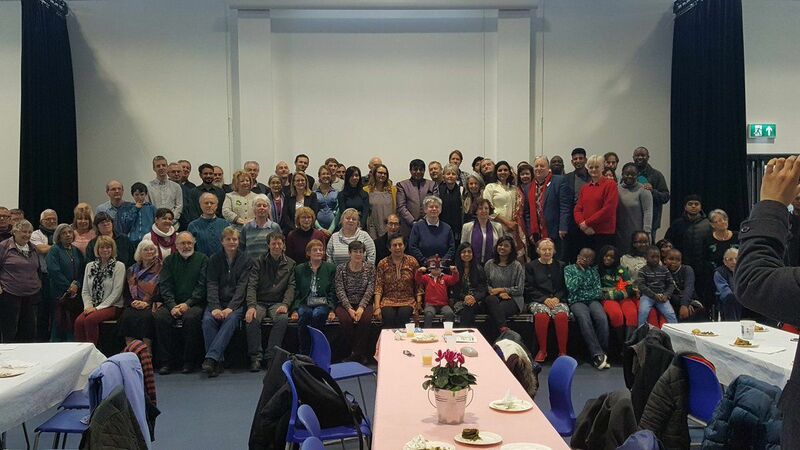 The Indian Vegetarian Society held its 34th annual vegetarian Christmas Lunch on Sunday 14th December. Nitin Mehta the founder of the society said that the aim of organizing the lunch was the same as when it begun 34 years ago. It is to celebrate Christmas as a national festival and to promote friendship between communities living in Croydon. The Indian community is proud to be British. 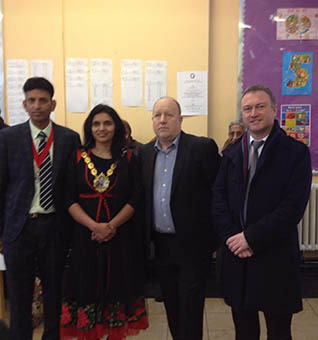 The Mayor of Croydon Councillor Manju Shaul-Hammed, MP for Croydon north Steve Reed and leader of Croydon council Tony Newman who is a vegetarian were amongst the guests. Around 130 people enjoyed an traditional Gujarati Vegan meal. The Mayor praised the Indian community for playing a positive role in society. MP Steeve Reed said that the contribution of the Indian Hindu community was great in all walks of life. Members of Purley United Reformed Church, Croydon ecology centre, Croydon vegetarians and Surrey vegetarians and vegans were present. Guests enjoyed a lunch of parathas, udad dal, peas and cauliflower curry, biryani and bhajias all Vegan followed by vegan cakes and tea. 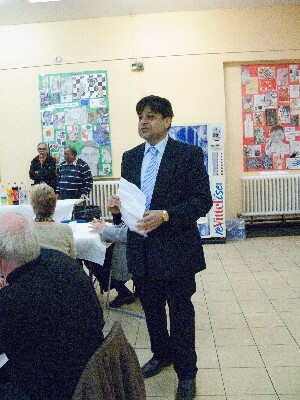 Nitin said that idea of a Christmas lunch was spreading as as a similar event was being held at the same time at Crawley Hindu temple and the Jain Centre in Colindale. Kamlalbhai Rao from Gujarat Samachar was present too. The delicious food was prepared by the ladies and popular chef Rajubhai Shah. Long term friendships are formed by sharing food together and our English friends are introduced to many varieties of Indian vegetarian food. A massive whole day protest was held. My respects to the committed organizers and so many people,young and old who turned up on a working day.For the whole day Japanese embassy staff heard the protesters and the passing motorists who hooted in support. The message will go back to Japan that they are getting a bad name and have to stop this cruelty. The attached picture was taken by fellow protester and friend Liz Goumas. 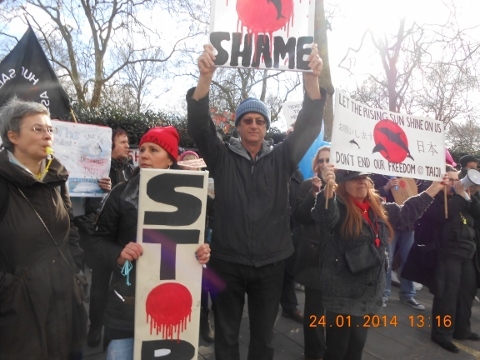 Over 2000 dolphins and small whales are brutally slaughtered every year in Taiji, Japan. The helpless animals are driven in a corner by boats. In shallow waters they are stabbed with metal spikes through their spinal cords. They die a slow and painful death. The butchered dolphins are consumed. The Bottlenose dolphins are captured by trainers and sold for upwards of $200,000 to marine animal parks all over the world where they are kept in captivity. In US alone dolphinariums represent a $8.4 billion industry. Protest outside Nepalese Embassy During the Gadhimai event that takes place every year in Nepal around 25,000 animals are killed to appease Goddess. Compassion in World Farming organized a protest outside the embassy on Saturday 11th. October. Famous celebrity and a passionate campaigner for animal rights Joanna Lumley addressed the rally as did Anil Bhanot of Hindu Council. Over 77,000 signatures urging the Nepalese Government to stop the slaughter were handed over to the embassy representative. It was a heart warming scene to see hundreds of animal rights activists who found the time to turn up for compassion towards animals. I addressed the rally and said: "Nepal is a beautiful country nestled on the footsteps of the mighty Himalayas. The majority of Nepalese people are Hindus, a religion which is deeply rooted in the idea of Ahimsa- Nonviolence. Hindus are forbidden to harm even an ant and it is due to this reason that most Hindus are vegetarian. The practice of killing animals to please Gods and Goddesses is a complete misrepresentation of Hinduism. Killing of innocent animals results in getting bad Karma. Bad Karma impacts individuals as well as countries. For the people of Nepal to have peace, happiness and prosperity it is vital to stop killing animals in the name of religion. The tens of thousands of animals killed at the Gadhimai event will fill Nepal with an atmosphere of violence, negativity and screams of poor animals. The beautiful country of Nepal does not need this negativity which will hang over it like an unmovable cloud. By showing mercy to animals Nepal will reap good Karma and people from all over the world will have praise and goodwill for the country. So standing here today in front of the Nepalese embassy in London, I urge the government of Nepal to immediately stop the forthcoming killing of animals. There are rare opportunities in life when an individual gets the opportunity to do something really noble which will make his or her time on this planet glorious. I urge the people of Nepal and the Prime Minister of Nepal to seize this opportunity and make history. I convey this message also as a patron of Quaker Concern for animals many of whose members are present here. I end with a quote of Mahatma Gandhi: The moral progress of a nation and its greatness should be judged by the way it treats its animals." An organization called SPEAK has been campaigning for last 10 years to stop the cruel practice of Vivisection going on at the world famous Oxford University. The group has been tirelessly demonstrating out side the Oxford University Animal Testing Laboratory for 10 years. 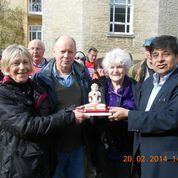 A Mahaveer Award was presented to the group on 20th February 2014. At the presentation I said that a day will come soon when this evil practice will end and at that time it is the compassion and commitment of SPEAK supporters that will be remembered with pride. 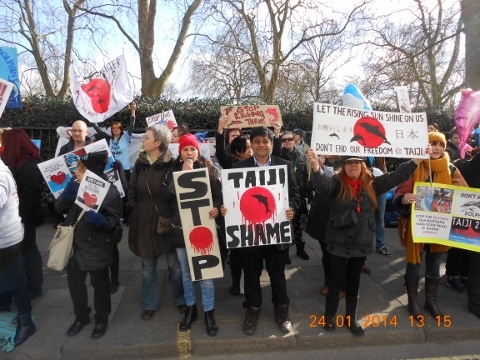 Hundreds of people held a nosy demonstration outside the Japanese embassy protesting the killing of Dolphins and Whales. The Japanese are building up bad Karma killing these beautiful creatures for no good reason. Young Jain, Sohum Shah, organised a vegetarian day at his school in Reading on the 20th May 2013. This was to celebrate the National Vegetarian Week. The school canteen served vegetarian meals all day for breakfast, lunch and dinner, including the boarding house (for the boarders). No meat, fish or eggs were served on the day. Around 550 pupils enjoyed the vegetarian fayre. The general feedback was great and the school is looking to organise more vegetarian days. The name of the school is Reading School and it ranks in the top 8 schools of the country. The article below is from the school newsletter. What a fantastic achievement! Around 130 people enjoyed a sumptuous Vegan lunch on Sunday the 9th December 2012 at the Archbishop Lanfran High School, Croydon. Amongst the guests were members of Purley United Reform Church, Croydon Ecology Centre, Vegetarian and Vegan Society and Friends of the Earth. The newly elected MP for Croydon North, Steve Reed as well as many councillors were present. 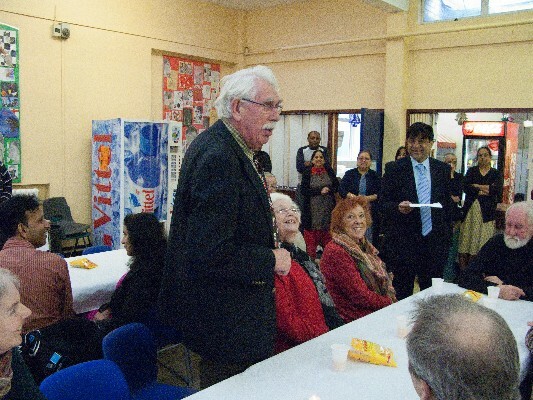 Steve praised the Indian community for the positive role it plays in Croydon. 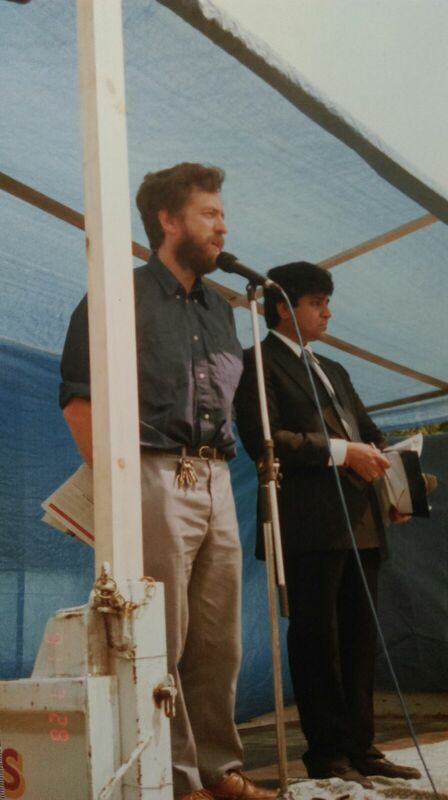 Leader of the Labour Council Tony Newman said that as a vegetarian he always looked forward to this annual event. Nitin Mehta in his opening remarks said that the lunch is organised to foster friendship and understanding amongst the communities living in Croydon and to introduce people to the delights of Indian vegetarian food. YIV members had worked hard to prepare the food and the vegan cakes after the lunch were a special hit. A Mahaveer Award was presented to Maharaz Tarlochan Das Jee on 11th. November 2012 at the Harrow Leisure Centre, Harrow, London, UK. Over 2000 people from many cities of the UK as well as people from India attended this grand event. Maharaz jee has a huge following in many countries. Maharaz jee preaches the ancient wisdom of India. He urges people to lead a spiritual life and serve mankind with humility. He emphasises the importance of a vegetarian diet. Before the presentation everyone was urged to take a vegetarian pledge by Nitin Mehta, founder of the Young Indian Vegetarians Society. The pledge was taken in Hindi as follows: "I will not eat meat, fish and eggs as from today. May God help me keep this pledge." In his speech Nitin said that Ahimsa is a gem of Bharatiya civilisation which we have to guard vigilantly. While many civilisations have come and gone in Human history, Bharatiya civilisation has remained alive due to the ideal of Ahimsa. Someone has said: Kutch Baat He Ase Ke Hasti Mit Ti Nahi Hamare. There is something about Bharatiya civilisation that it has remained alive in spite of so many challenges and that something is Ahimsa. Compassion towards animals and vegetarianism are the ideals that the saints and sages of India have propagated for centuries. Our Ahimsa is the Ahimsa of the brave not of cowards. As Kal Yug progresses if we keep our vegetarian diet then it will be easy to keep our Dharma alive for centuries to come. Nitin requested Maharz jee to get millions of people in India to take the vegetarian pledge. Param Pujya Sant Tarlochan Darshan Das Ji you are keeping alive values of our ancient Dharma. Compassion towards all living beings and Ahimsa are the gems of Sanatan Dharma. With your guidance Bharat will once again lead the world towards the right path. A special thanks to Raj who is a devotee of Maharaz. Rajji helped to make this presentation possible. The celebration started at the Queen's Gardens Croydon at precisely 3pm and right on cue the sun shone through! The event started with the Hare Krishna chanting party led by Nabinandan Dasa, (Nipan Malde) . This was followed by the Swaminarayan Balika Mandal prayer and song. The children from Oshwal Association Gujarati Classes sang beautiful devotional songs. The Jagruti Ladies group then presented Gujarati Folk dance, (Garba) and stick dance (Dandya Raas). MP for Croydon Central Gavin Barwell joined the dancing party! The Brahma Kumaris had a stall and they gave a message of upholding spiritual values. A prayer was also read by a bishop of a Croydon Evangelical Church. 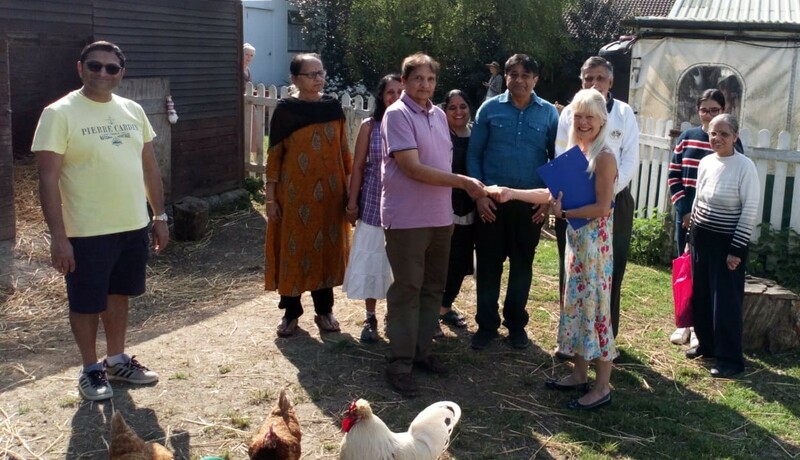 The Mayor of Croydon Eddie Aaron and his wife Judith Aaron both of are vegetarians, congratulated the Indian community for its positive contribution to Britain. The Mayor urged the community to keep alive culture and languages. The best part of the event was when everyone spontaneously started sharing their vegetarian picnic people from many background shared food and made friends! A special thank you to Smitaben Rawal, Kusumben Shah, Priti Shah and the ladies of Jagruti Group. Thanks also to Kamalbhai Rao and Gujarat Samachar for the ouboicity they gave to the event. Les and Angie Kemp for providing the PA system without which we would have been lost! The programme concluded with a pledge taken by many people present that they will remain vegetarian for the rest of their lives. 1. Proudly promote vegetarianism to friends and relatives where as before they never did that. 2. They became aware of the cruelty that we humans inflict on animals. 3. They were pleasantly surprised to know that Hinduism extends the hand of compassion to other living beings and became aware that it our duty to show compassion to an ant as well as any other animal. Compassion to all living beings is the secret of the survival of Sanatan Dharma and Vegetarianism is a must for practicing Hindus. 4. They realised the abuse inflicted in experiments on animals, hunting, export of live animals to far away countries and also about the cruelty in milk production. Going Vegan is something they should consider. 5. They realised the importance of going only to vegetarian restaurants and avoiding leather goods. 6. They were impressed with the idea that no matter what the circumstances they will face in life they will never eat meat. 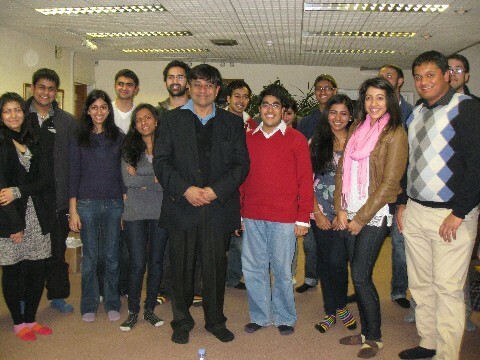 A special thanks to Sagar Shah who organised the talk and to Shaunak Prabhu of the Oxford Council of Hindu Studies at whose office the event was held. The Young Indian Vegetarians organised their 31st annual Vegetarian Christmas Lunch on 11th December. Mayor of Croydon Councilor Graham Bass and Malcolm Wicks were amongst the guests. Around 120 people enjoyed traditional Indian Vegetarian dishes. 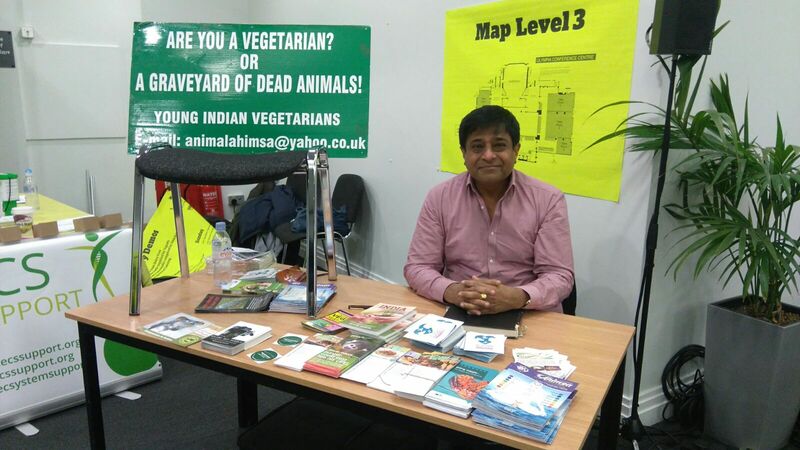 Nitin Mehta the founder of YIV said that the aim of organising this annual event was to promote friendship and understanding between the people of Croydon and to introduce people to the many varieties of Vegetarian and Vegan food. You can have a good healthy Christmas without the Turkey! The riots of the summer meant that the people of Croydon need to come together to bring about all that is best in our town. Amongst the other attendees were members of the Purley United Reform Church, Croydon Ecology Centre and Night Watch. The Mayor congratulated the organisers and said he was always looking forward to this annual event. Malcolm Wicks praised the Indian community and said greater efforts needs to be made to promote more integration. One of India’s most influential spiritual leaders ~ His Holiness Brahmrishi Shree Kumar Swamiji honoured at the UK Houses of Parliament. 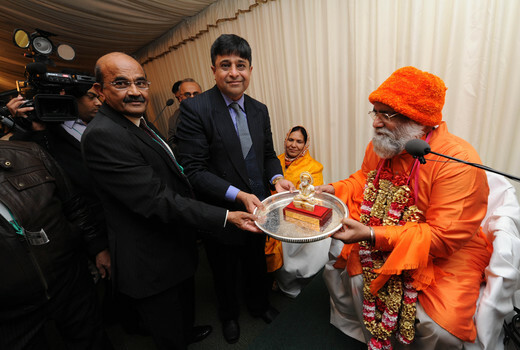 The Houses of Parliament in UK, played host to one of India’s greatest spiritual leaders, as His Holiness Brahmrishi Shree Kumar Swamiji, was honoured by politicians, campaigners and peers in recognition of his outstanding contribution, dedication and service in improving human welfare across the World, through his message of interfaith harmony, equality and brotherhood for people of all faiths. Swamiji received the Mahaveer Award from the Young Indian Vegetarians Society. The award was presented by Jaysukhbhai Mehta. Nitin Mehta urged Swamiji to mention vegetarianism in all his talks. He also requested that an event in India be organised where around 10 Lakh people would take a pledge never to eat meat. 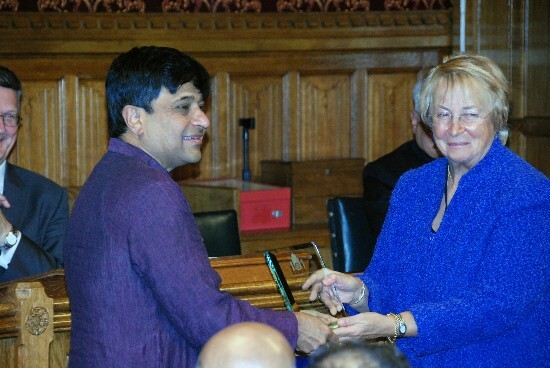 The institute of Jainology conferred the Ahimsa Award to Nitin Mehta on 12th October 2011 at the House of Commons. Nitin said: 'Amongst the other recipients of this award are Nelson Mandela and Dalai Lama. They are giants who have changed the course of human history.' I pay my humble respects to them. Nitin made an impassioned speech to the august gathering to promote Ahimsa, vegetarianism and animal welfare. 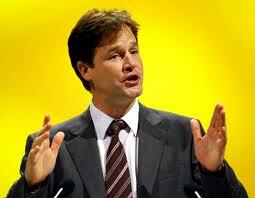 Deputy Prime Minister Nick Clegg Questioned! On 27th August the deputy Prime Minister did a question & answer session with a select audience. I had the privilege to ask the first question. The question: Mahatma Gandhi said 'the moral well being of a nation and its greatness should be judged by the way it treats its animals'. The time has come to form a charter of animal rights so that their abuse in blood sports, factory farming and vivisection can be stopped. The government also needs to promote a plant based vegetarian diet to help stop global warming and improve the health of the nation. Can the animals count on your governments support Mr. Clegg? The deputy PM replied: We are a nation of animal lovers and the government wants to do as much as possible for animal welfare. Banning of experiments on animals for cosmetics is one of our achievements as a country. The reaction of the public to the recent dumping of a cat in the bin shows how passionately people feel about animal welfare in this country. Though the answer was not very positive, the question has been shown on BBC TV and in a interview on LBC radio the question was brought up again. Nick repeated that he was aware of the immense concern amongst the public about animal welfare. Nick referred the question as one of the good ones! 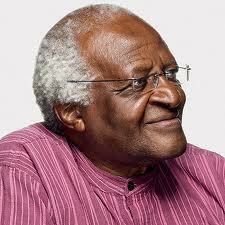 Desmond Tutu World Statesman Questioned! Desmond Tutu came to Croydon Fairfield Halls on Thursday 5th August for a meeting with the public. He was interviewed by Trevor McDonald. This was followed by questions from the audience. I made sure Trevor asked me to put a question! This is what I asked: Thanks to great personalities like Mahatma Gandhi, Nelson Mandela and you Sir that some of the cruelties and injustices perpetrated by human beings to their fellow humans have ceased. The time has now come for we humans to stop the violence and abuse we inflict on the animal kingdom. Can the animals count on your support Mr. Tutu? Gandhi strongly believed that animals need to be treated with compassion and dignity. Can you help the cause of animals and go vegetarian also? Desmond Tutu laughed his infectious laugh and said he liked eating chickens! He then said in the garden of Eden everyone was vegetarian but we have slipped. He said he agreed that all humans and animals should be treated with compassion and no one should be harmed. But he said, 'I am not going vegetarian!' There were over a thousand people and I was glad to put across the cause of animals. 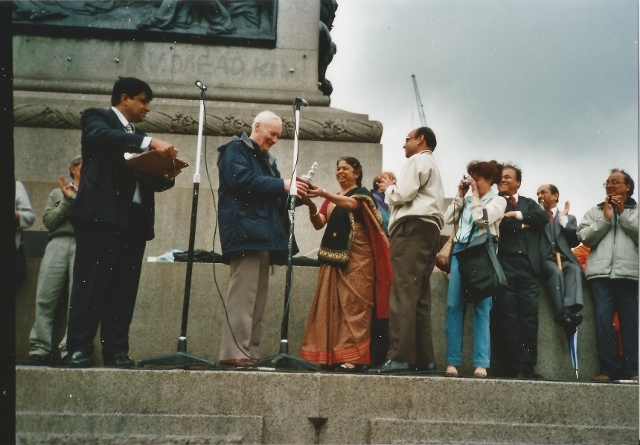 A prominent vegetarian campaigner from Nottingham Pat Smith was awarded a Mahaveer Award at the Nottingham Hindu Temple on Saturday 27th Feb. 2010 for his untiring efforts to promote a vegetarian and vegan lifestyle for almost 25 years. 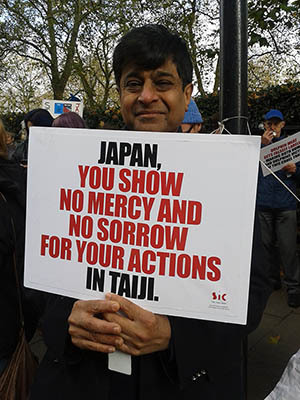 Nitin gave a speech at Trafalgar Square, London on Feb 22nd 2009 organised by The Supreme Master Ching Hai International Association to raise public awareness on the impact of livestock and dairy industries on global warming. Click here to view video. On 26th October the Mahaveer Award was Presented to Sri Mata Amritanandamayi . On 17th May 2007 the Mahaveer Award was Presented to Sri Sri Ravi Shankar and Lord Swraj Paul. On 29 Jan 2007 the Mahaveer Award was Presented to Sadhguru Jagi Vasudev. The YIV Annual Christmas Lunch. We have been organising a Christmas Vegetarian Lunch for over 25 years in Croydon. The objective is to promote friendship with the people of Croydon. PRESS RELEASE - Swami Ramdev who has brought about a health and cultural revolution in India through Yoga was presented with a Mahaveer award on 13th July 2006. In response to an article in the Guardian Weekend Magazine about Morgan Spurlock who ate nothing but MacDonalds (the film Supper Size Me) and the damage it did to his health, the following letter was published. Apart from the health benefits of a plant-based vegetarian and vegan diet (Super Green Me, January 7), the ecological and environmental benefits are great, too. Some 55 billion animals are raised and killed for meat every year. Our planet is simply not big enough to sustain these numbers. The result is destruction of rainforests, spreading of deserts and massive methane gas emissions. The amount of grain fed to these animals could feed almost 4 billion people. To safeguard the planet for future generations, a return to vegetarian and vegan diet is imperative. We organised our annual lunch which we have been doing. for over 25 years on 18th December.This year we jointly organised the event with the Wanza Community of South London Around 100 people enjoyed the lunch and came to understand better the need for adopting a vegetarian diet. The Mayor of Croydon councilor Maggie Mansel was present as well as Lord Weatherill (former speaker of parliament and a vegetarian) Tony Newman (leader of Croydon Council and a vegetarian), Brenda Kirby (past Mayor of Croydon and a vegetarian) Malcolm Wicks Minister for Energy. Members of Croydon police as well as representatives from local churches and the Rotary club of South Croydon were also present. The menu was: Starters: Cassava fried with Bateta Vada and chutney! Main: Potato and Peas sabji, Bhathura, Mexican Rice,Salad. This was followed by tea and Vegan cake. Many people at the lunch were not vegetarian and went away thinking about it seriously! better Britain. Every Indian organisation should put together a similar Christmas event. Navnat Vanik Association also organises this event and the local residents coming in big numbers. The YIV annual Christmas lunch will be held on Sunday 18th December at Lanfranc High School at 1 PM. I was invited to give a talk to the Rotary Club of South Croydon on 14th November. The title was, 'Benefits of a Vegetarian Diet.’ It was a lunch time meeting at a Chinese restaurant. Read more here. The Vegetarian Society held its annual awards day yesterday ( 27th ) at , ' Cutty Sark' an 1830 ship marooned at Greenwich. Wendy Turner Webster a TV personality and former MP Tony Banks were amongst the guests. The best vegetarian cafe awards went to the, 'Maitreya' of Bristol and the 'Rainbow' of Cambridge. The Raninbow has also received a Mahaveer Award from us. I was privileged to be asked to give away the award for the best vegetarian and cruelty free body and skin care product. The award went to a company called, 'Living Nature'. Here is a wonderful example of Indian community working together with English, Welsh and Scottish people for a common cause! We are all united in Ahimsa! The YIV will be at Guys Hospital on Tuesday October 4th at 10am in the Children's ward giving a short talk and serving a vegetarian meal. Finally we have our web site up and running. Feel free to explore our pages and feedback any comments you may have. There are currently 2 newsletters available for perusal. We hope to update this selection soon. Home | News | Newsletter | Writings and Lectures | Mahaveer Awards | Links | Copyright © 2005-2013 The Young Indian Vegetarians. All Rights Reserved.